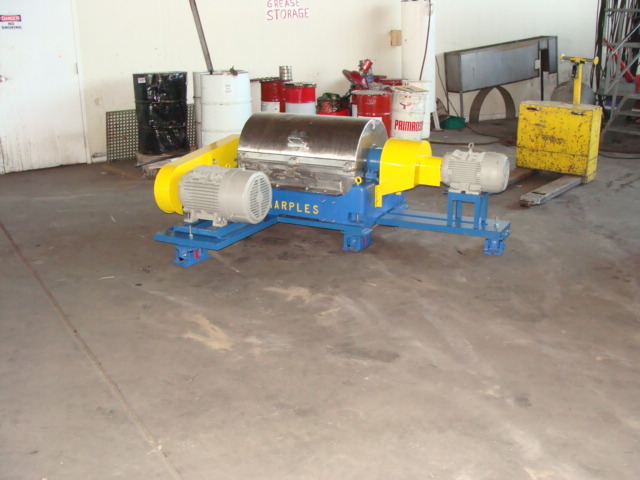 Reconditioned Sharples P-3000 decanter centrifuge. 14″ x 30″ bowl dimensions. 10 degree beach. 4000 RPM maximum bowl speed. 3180 x G maximum G-force. All stainless steel product contact areas. Available with P-52, 125 or 165 : 1 gear ratios. 25 or 30 HP main drive motor. 7.5 or 10 HP back drive motor. Control panel with variable frequency drives (VFD), programmable logic controller (PLC) and touch-screen operator interface available.